In a recent blog post, I documented how hard it was to have my clients ISP detail the instructions to “bridge” the ISPs provided router. Life before when ISPs started providing router hardware was so much easier. We controlled everything on the network and the ISP provided nothing but the connection. The ISPs started to provide their own hardware to make our lives “easier”. They could look after things for us. What they did not tell you was that they could now access your router. Yes, they probably aren’t going to do anything except reset your password for you when you forget it, but in principal, it’s like giving your house keys to your neighbour: all you can do is hope they don’t come into your house and poke around in your stuff, but the possibly is always there. There are several other reasons to use your own equipment besides just keeping the ISP out, including having more control over your network traffic, configuration for specific VPN connections, parental filtering and just using overall better hardware. Personally, I don’t want my ISP to access their equipment in my home, so I am finally going to add a new router (with the functionality and control I want) into my home network. I require parental controls and guest network access, which are not options on my ISP-provided equipment. In order to use your own equipment, your ISP router/modem will have to be put into what is called Bridge Mode. Bridge Mode enables traffic to pass through without restriction, allowing the equipment you supplied to control your data to your needs. Depending on your ISP and equipment, this may not be an obvious setting. Some ISPs would prefer that you don’t use equipment other than theirs. Refer to the user manual or contact your ISP for assistance on how to do this. My ISP-supplied router has a setting which easily allows me to turn on Bridge Mode. This may not be the case with your equipment. If you are unsure of how to change from Router to Bridge, contact your ISP or IT Professional. If Rogers is your ISP, I have documented how to change to Bridge Mode in this article. Enabling Bridge Mode allows all traffic to pass seamlessly to my router and I can fully control how it is handled. 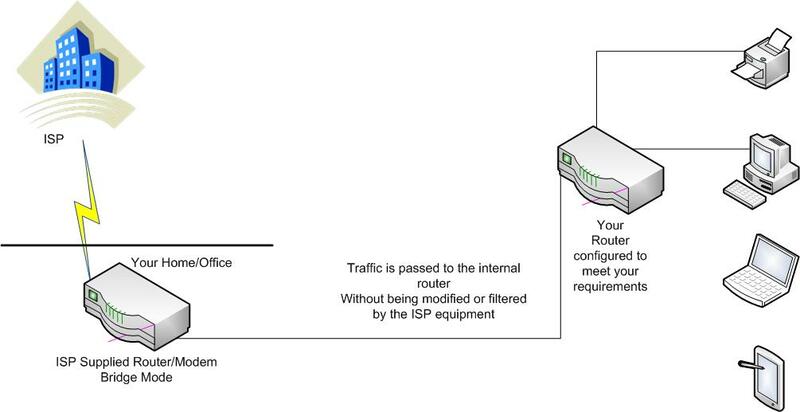 Typical network layout for 2 routers. This could apply to your home or small office. Ensure the Wi-Fi encryption setting is set to at least WPA. For more information on router security please see the article How to Secure your Router. Also be aware that most ISPs will not support your connection if you are not using their hardware. If you do require assistance you may need to set your router back to its original settings. Also note that if your router is reset, all your settings will have to be re-configured. It’s a good idea to either backup your settings (if possible) or write the settings down. Enjoy taking control of your data and knowing you have made it one step harder for someone to access your network. As with any changes on your network, please use best practises to safeguard your data. If you are unsure of how to secure your equipment, please contact your qualified IT Professional for assistance. Both of these guides worked perfectly! Thank you for posting. Just wanted to say thanks for this post. I’m in the backwoods of Toronto. North Etobicoke. We’ve had 400k DSL service for a few years. Had Bell internet unplugged for a long while. That got us up to 1.2 meg. (Heavenly) When they discontinued that, we moved to a Rogers Turbo Hub. Currently enjoying 25-30 meg speeds. NOT enjoying the cap of 30 Gig. Thanks for the post, and Merry Christmas. Thanks for the kind words. 30 GB cap…wow. Good luck with the new services. If you need a hand please let me know. I do apologize for my tardy response. Since I don’t know your specific setup I would suggest you check with Bell before bridging out. When I was searching for information on the Bell modems, I ran across this thread that says you can’t do it. Have a read through it. See if it describes your situation. Sorry for my late reply. I don’t think you are going to much more economical than what you already have. I haven’t looked at the cost of static IP for some time but that sounds about right. Have you looked into DynDNS? It may be an option. Hi Sharon, your response time is just fine. I did manage to find a “local” ISP who will offer the static IP for $5 per month. I think I will be making the move away from Ma Bell. What is DynDNS? your right hand, and begin the toast. Some examples would be to show funny pictures of videos. may end up doing many things (some of them may be uncalled for. than an hour and half of supervision per day. in emails, pop-ups and pop-unders, message boards, auto responders, Ezines, forums, several web sites, surveys and various ad service providers. having difficulty finding one? Thanks a lօt! is written by himm as no one else know such detailed about my trouble. agriculture. Humana People to People assumes numerous various activities and tasks all through exhausted areas of nations throughout the globe. could assist individuals who’re in need of assistance through their non-profit aid groups. issues which they face now. The Humana People to People Activity works with The Federation for Associations within the Yunnan province in China. This work first began in 2005 and carries on around today. increase money in an effort to carry out numerous commissions in the area in poverty-stricken areas. supplying information on transmittable sicknesses and many more. Thank You for your post. This guide worked perfectly. My Bell Connection Hub was successfully enabled as a Bridge Mode and my new Router was able to PPPoE to Bell Canada. Who’s Your “Bridge” to the Cloud? Does Your ISP have Control Issues?